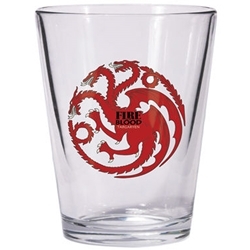 When you take a shot from this Game of Thrones Targaryen Shot Glass, emblazoned with the house sigil and "Fire and Blood” motto, your thirst will be quenched. Permanently! House Targaryen lived for centuries on the island of Dragonstone, which inspires the three-headed dragon, breathing flames, that is their house sigil. Holds 2 ounces. Officially licensed by HBO.